A damning report from the Banking Standards Commission blames the top three fatcats for HBOS's collapse in 2008 and recommends they don't darken the City's doorstep ever again. Worth more than £40bn at its peak in 2007, HBOS was brought to its knees as the financial crisis took hold a year later. The bank had spent much of the previous decade racking up massive loans, many of which it was forced to write off. HBOS’s ‘reckless’ lending policies resulted in losses of £46bn and the bank, the UK’s fifth largest lender at the time, had to be rescued with a £20bn bailout from the taxpayer and a merger with Lloyds in 2008. The Banking Standards Commission, a parliamentary body headed by MP Andrew Tyrie and set up last year to examine and improve the UK’s banking culture in the wake of the financial crash, has now published its long-awaited account into HBOS’s demise and has laid the blame squarely on the three men who were in charge of the bank at the time. Former CEOs Sir James Crosby and Andy Hornby and ex-director Lord Stevenson were slammed for a ‘colossal failure’ of management which focused on pursuing a high-risk strategy, and the Commission has recommended the three should be barred from working in the financial sector ever again. Following the damning report, Sir James Crosby today stepped down from his advisory role with private equity firm Bridgepoint. ‘The combination of higher risk assets and risky funding represents a fundamentally flawed business model and a colossal failure of senior management and of the board,’ the report concluded. 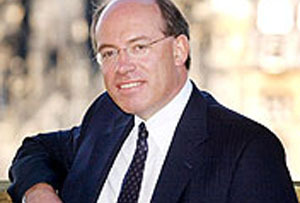 Lord Stevenson was the former chairman of HBOS; Sir James Crosby was the chief executive from 2001 up to early 2007, and Andy Hornby was CEO for the following two years. Peter Cummings, another former HBOS director has already been penalised by the now-defunct FSA. He was fined £500,000 and banned for life from working in the City last September. HBOS was created in 2001 from the merger of Halifax and Bank of Scotland and became one of the biggest disaster stories of the financial crisis: the total cost of bailing out the bank hit £30bn. HBOS wasn’t the only UK bank to face a bailout from the UK government, but the Commission said it had been the worst managed. After Lloyds’ ill-fated takeover of HBOS seven years later, Lloyds Banking Group subsequently received a huge bailout from the state and remains 39-percent owned by the taxpayer. Calling for such a ban is an unprecedented move by a parliamentary committee: what actions will be taken, if any, remain to be seen.